Rediff.com » Business » US-China trade war: How India stands to GAIN! US-China trade war: How India stands to GAIN! China is on the lookout for investment pastures where its money is welcome, safe and earns a decent return. India also needs vast investment - about $1 trillion over the next 10-15 years - in infrastructure, green energy, transportation and heavy industry, says Ravi Bhoothalingam. The trade war launched by President Trump against China is in high gear. Chinese exports to the USA worth $250 billion are now subject to additional imposts. A further $250 billion could suffer similar - or worse - treatment, if China does not take steps to rectify “unfair” practices in its trade and intellectual property regimes. 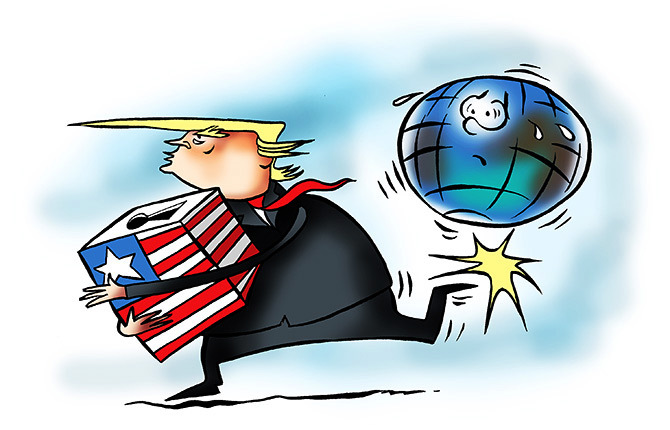 Another blow is the USA’s recent renegotiation of its free trade agreement with Canada and Mexico (USMCA) which contains a significant clause - that any party to that treaty can pull out of it if one of them signs a free trade agreement with “a non-market economy” - read “China”. All this is not good news for anyone - world trade will take a knock as global supply chains readjust painfully to cope with these realities. But for China, it is a double whammy. First, there will be a scramble as some of its exporters relocate to other destinations. Second, if the USA signs USMCA-like trade deals with Europe, Japan and others, China could find its global trade footprint under pressure. Even if America does not carry out its threat in full measure, its stance could influence allies to constrict their trade with - or investment from - China. This is a warning shot across China’s bows. There could be a silver lining for India. Such a threatened ‘trade encirclement’ could make China review its stance in the on-going negotiations to conclude the Regional Comprehensive Economic Partnership (RCEP) - a 16-nation free trade agreement which includes China and India but excludes the USA. Indian industry has been sceptical of any benefits of India’s free trade agreements signed with ASEAN and South Korea, and is particularly fearful that, after RCEP comes into force, duty-free Chinese imports might disembowel a large section of Indian industry. Thus, India has sought long transition periods before Chinese goods can enjoy RCEP-enabled duty-free access into India, and this constitutes a sticking point in the deal. But the trade war might prompt the Chinese to take a more accommodative position. If that happens, will India play ball? Indian industry is deeply divided. One section feels that India must embrace the RCEP which inter alia will open China to duty-free access, offering vast opportunities for Indian manufacturing and services. But another section prefers to remain sheltered behind India’s tariff regime, fearing massive business losses if Indian industry faces Chinese competition, whether with transition or not. In an election year, those risks look scary. India’s present “RCEP moment” seems to echo China’s “WTO moment” in many ways. In 2001, China acceded to very strict conditions imposed by the World Trade Organisation (WTO) - so harsh, that many hard-boiled trade negotiators wondered if that country had taken a step too far - to join the multilateral trading system. In the event, China took the leap into the future, with results now evident. For India too, the RCEP accession may be just the right trigger for “Make in India” to rise and fly, albeit with some blood, sweat and tears. This is where China fits in. Right now, China is rebalancing its economy away from investment to consumption. And from an export-surplus economy to one with a greater balance in its world trade. The pressures now faced by China from the USA (and potentially from others) should make it look more seriously at expanding its investment and trade with India, and thus to examine the Sino-Indian bilateral trade deficit with greater care. Indeed, China can source some of its consumption needs directly from India. Take medicines. India is rightly called the ‘pharmacy of the world’ with more than a 40 per cent share of the US generics market. The healthcare bill for Chinese families can be significantly reduced if their people could buy inexpensive Indian generic pharmaceuticals. In recent months, a popular Chinese film Dying to Survive depicted the true story of a Chinese leukaemia patient who smuggled cheap anti-cancer generics from India to treat a thousand people afflicted by chronic myeloid leukaemia. China supplies 85 million of the world’s tourists, but only 280,000 Chinese visit India each year. Promoting Chinese tourism to India could bring huge benefits to India by way of revenue and employment. There are other possibilities: a 2016 report of the Confederation of Indian Industry (CII) has highlighted five areas where India can increase exports to China, and 18 fields for mutually productive Chinese investment into India. President Trump has also imposed a stricter scrutiny of China’s investments - existing and proposed - in the USA. Other countries too have become wary. So, China is on the lookout for investment pastures where its money is welcome, safe and earns a decent return. Moreover, China’s recent setbacks in its Belt-and-Road (BRI) projects in Sri Lanka, Malaysia and Pakistan could not have been too comforting. India, on the other hand, has a stable political environment and a reasonable investment climate with the necessary regulatory controls and sound (though slow) legal processes. India also needs vast investment - about $1 trillion over the next 10-15 years - in infrastructure, green energy, transportation and heavy industry. And India will not be a negotiating push-over for China. Overall, the match seems ideal. Indeed, without such investment, can India achieve the growth rates required to bring prosperity to its people, let alone aim to become a global power? India thus faces a peculiar dilemma. On pure economic logic, China’s investment case makes sense for India. But that means dealing with a geopolitical rival to strengthen our economic sinews - can we have our cake and eat it too? To India’s leaders, that poses a crucial challenge, demanding political sagacity and dexterous diplomacy.